In a recent blog post, Defenders of Wildlife is grossly misleading the public claiming that they have “saved the last wild bison” by participating in and supporting the quarantine of buffalo that originated as wild calves from Yellowstone. Quarantine is a domestication process. There is no benefit from quarantine to bison as wildlife. Quarantine is no more than a fear-based control response to unfounded livestock industry complaints that are nothing but efforts to protect a subsidized lifestyle. Despite public opposition, the initial Quarantine Feasibility Study conducted by USDA-APHIS and Montana Fish, Wildlife & Parks (MFWP) was initiated in 2005 and 2006. Beginning with the capture and slaughter of hundreds of wild bison under the highly controversial Interagency Bison Management Plan the study involved taking 100 buffalo calves from those destined for slaughter and transporting them to the Corwin Springs Quarantine Facility, located in the Gardiner Basin, one of North America’s largest wildlife migration corridors. Located just a few miles from where they were born free beings. Wild bison have highly complex social structures, much like elephants, and humans have barely scratched the surface of beginning to understand their deep emotional bonds and cultural dynamics with each other and the land. The buffalo that started this scientific experiment lost their mothers, grandmothers, sisters, brothers, fathers and cousins — their nurturers, protectors and teachers — to genocide, and would begin a life of imprisonment and torture in the name of “conservation” under a livestock paradigm. These orphaned calves — the ones that would survive — were doomed to spend the rest of their lives behind bars. Through the first year of the study, at least half of the calves were slaughtered and culture tested for brucellosis. The original calves that did not perish under quarantine study conditions matured physically and were forced into captive breeding. Nearly half of these buffalo, including their captive-born offspring, were slaughtered, while others died from injuries caused by human handling. Nearly ten years later, the survivors have lived their lives locked behind electric fences, repeatedly handled and tested by humans, fed hay, and wear ear-tags. Quarantine, captive breeding, and artificial feeding causes a breakdown of family structure, unnatural breeding patterns, and a general loss of skills learned from natural settings and seasonal migration. In short, the buffalo that survived quarantine are much like domestic buffalo and therefore will not benefit species conservation. They are now like other captive herds, genetics bottled behind fences at the expense of wild integrity. Five years into the quarantine program, Montana Fish Wildlife & Parks had made little effort to find a place for these buffalo once they “graduated” (their term) the study. Slaughter was threatened, even though there were numerous tracts of public lands in Montana where they could have gone, and numerous tribes had expressed great interest. MFWP rejected all of these options. Ted Turner agreed to house 87 of them in exchange for keeping 75% of their offspring, a hotly contested deal made by Montana which, because it violates the public trust, was litigated by Buffalo Field Campaign, Western Watersheds Project and a few other wild bison advocates. 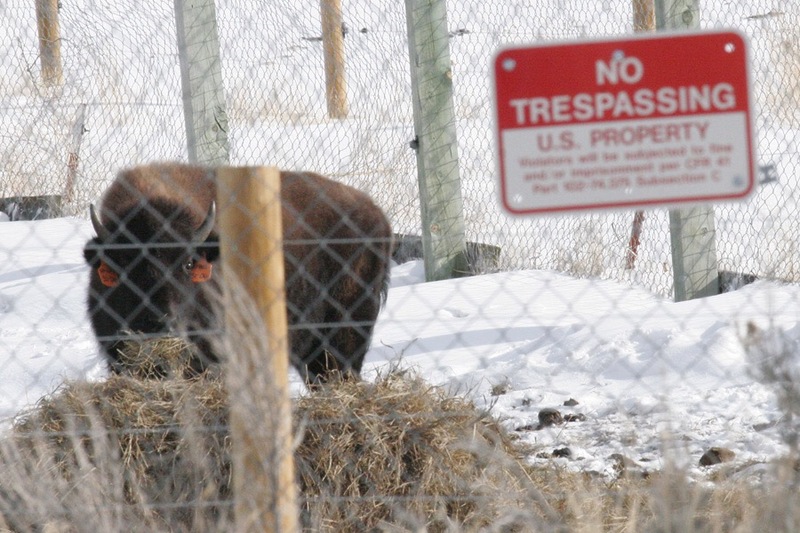 In February 2012, the Montana Fish, Wildlife & Parks Commission voted to approve the relocation of sixty-eight quarantined buffalo (all that remained at the Corwin Springs quarantine facility) to the Fort Peck and Fort Belknap Indian Reservations in northeast Montana, with transport paid for by Defenders of Wildlife. Defenders sent out numerous emails touting the transfer of the catchy-titled “Yellowstone 68.” About a week before the transfer they again announced the coming transfer of what had inexplicably become “The Yellowstone 65.” What happened to the other three buffalo? The group didn’t say. On Monday morning, livestock trucks arrived in the Gardiner Basin along with Montana Department of Livestock riders to haze, corral and load a uncertain number of quarantined buffalo onto the trailers for transport to the Fort Peck Reservation. Fort Belknap received half of these buffalo after fencing projects were complete. After a 500-mile journey, 62 buffalo were unloaded into a one-acre “pasture”. Three died as a result of being transported but we still don’t know what happened to the other three. Buffalo Field Campaign reported extensively on these situations. 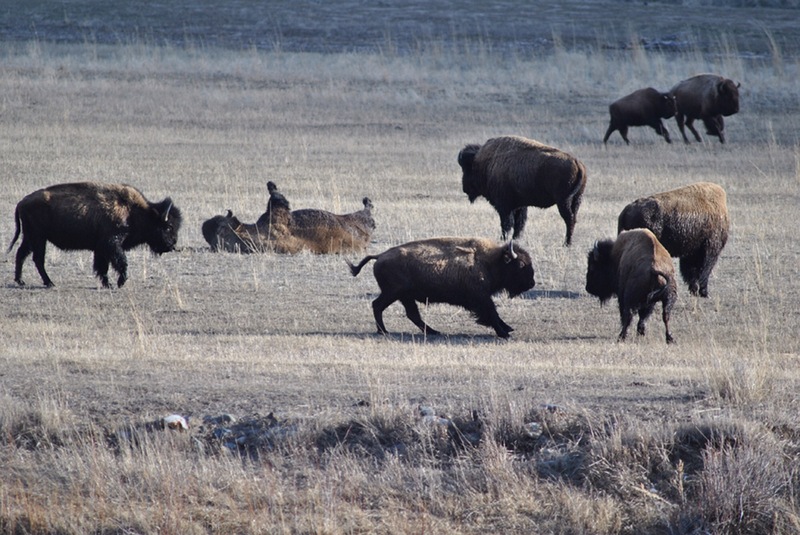 Now in 2014, approximately 146 of the buffalo held at Turner’s have been transported to the Fort Peck Indian Reservation. One bull never made it; he was killed for not being “cooperative.” These buffalo, joining the initial 60-something and their offspring, will be used to assist other tribes with the provision of buffalo, and the Fort Peck Tribe’s business herd. The buffalo will live on “range units,” various pastures with electric boundary fences, that total 10,778 acres. These buffalo will be culled annually and be ear tagged. While their genetics may be preserved, their wild integrity and migratory nature is eroded. Per the contentious agreement between Montana and Turner, for his “hospitality,” Turner is keeping 200 buffalo that originated as public wildlife from Yellowstone National Park. They have become Turner’s private, domestic livestock in perpetuity. Photo credit: Stephany Seay, Buffalo Field Campaign. The quarantine process has produced more buffalo behind fences, and Defenders of Wildlife has made money and headlines off of the buffalos’ suffering, supporting efforts to domesticate them, something that has been done a million times over in this country. Quarantine is completely unnecessary and a serious threat to the wild integrity and character of migratory bison, and plays right into the hands of the livestock industry. Quarantine is not restoration, it is domestication. It validates the brucellosis farce, even though there is no evidence whatsoever that wild bison pose any threat to domestic cattle. And if so, remove the cattle. Quarantine does not stop the senseless slaughter that continues under the Interagency Bison Management Plan — it continues because groups like Defenders claim false and meaningless victories, subduing the public into thinking that everything is okay and we can all go home now. Quarantine is a slap in the face to First Nations Buffalo Cultures who have been told by the federal government that this is the only way they will ever have their relatives return again. “Hau Mitakuepi, The buffalo have just as strong a connection to their land as we Indian People do. And just like us, the buffalo are being severed from their land by being put on ranches and domesticated. They are trying to turn buffalo into cattle just as they tried to turn Indians into Whites by putting us on reservations and sending us to boarding schools. Buffalo are not cattle anymore than Indians are Whites. They can’t live without their connection to their land. They must be allowed to roam free. Pidamaya. Mitakuye Owasin.” ~ Nick Anderson, Cultural Chairman and Historian, Mendota Mdewakanton Dakota Community. Buffalo Field Campaign has always opposed the quarantine of wild bison as it is exclusively suited for domestic animals and is not consistent with accepted wildlife conservation practices. Quarantine just means more buffalo behind fences. BFC advocates for expanded habitat and migration corridors and if extensions of habitat are consistent with migratory patterns, it is highly possible for buffalo to naturally move to areas currently considered for the placement of quarantined buffalo. Quarantine is in the way of wild bison restoration. Quarantine is designed as a control mechanism, something to placate livestock industry fears while providing lip service style “restoration” to the public and tribes. It has been proposed for Yellowstone buffalo in the context of a need to control population growth and to promote restoration of buffalo to other areas. However, population pressures are due to artificial constructs. The IBMP’s target population of the 3000 buffalo for Yellowstone National Park is not based on the ecological carrying capacity of the park, it is based on livestock politics. True restoration lies in habitat and migration corridors. Wild bison will restore themselves and need no “help” from humans. Quarantine is an insulting government program force-fed to First Nations as the only way to reconnect with buffalo. It is damaging to wild bison and the Tribes that would see them home again. Is that all we can do is abuse wildlife, create livestock situations and call it wildlife restoration? We can certainly do better in our efforts at “wildlife restoration” than to abuse and treat members of America’s only continuously wild population of buffalo like livestock. The bison quarantine debacle is another sorry example of how Montana has made no demonstrable commitment to manage buffalo as a wildlife species in the state, and they have clearly shown that they have no idea what it means to have a public trust responsibility to buffalo. All Americans, and Montanans in particular, should apply pressure on Montana Fish, Wildlife & Parks and Montana Governor Steve Bullock asking them when Montana will begin to live up to its responsibility to protect buffalo as a native, migratory wildlife species in the state. We will continue to fight for the buffalo’s right to roam and to help heal the broken relationships that have resulted from so much human arrogance, ignorance, and greed. Buffalo Field Campaign continues to honor Native Americans and their sacred relationships with the buffalo, and we will be here until buffalo resume their rightful place on the landscape as the self-willed wild creatures that they are. Is there any end in sight when it comes to the bison slaughter? Another thing that has to happen is a repeal of MCA 81-2-120 http://leg.mt.gov/bills/mca/81/2/81-2-120.htm which gives the Montana Department of Livestock authority over wild bison in Montana. Repeal of this law and ESA protection will stop the slaughter. Thank you and your team at the Buffalo Field Campaign for the valuable work you are doing to end the bison slaughter and help enable them to once again roam free. Please will you educate me about the actions (positive and/or negative) that Defenders of Wildlife has taken regarding the Montana (Yellowstone) bison? All I have read here is that Defenders of Wildlife paid for the trucks that transported the former Yellowstone bison from the Ted Turner ranch to the Ft. Peck reservation. Should they not have done this? I thought that the whole quarantine operation was the outcome of the Montana Livestock Dept., the Montana FW&P and the U.S.Fish & Wildlife Service — and that Defenders of Wildlife has nothing substantial to do with the strategy or operation of the bison quarantine.(?) Please help complete the bison-Defenders of Wildlife story to fill in the missing pieces, if there is more we should know. The larger issue on quarantine is that Defenders is spinning it as if it is “saving the last wild bison” which is is indeed not doing. They are misleading their supporters into thinking that quarantine solves the issue of hazing, capture and slaughter – which it doesn’t even touch. They are ignoring — and, indeed, undermining — meaningful efforts to truly protect wild, migratory buffalo. The Quarantine Feasibility Study was a joint project of USDA-Animal & Plant Health Inspection Service (who also harbors the malevolent Wildlife Services) and Montana Fish, Wildlife & Parks. While Defenders wasn’t involved in the actual quarantine process, they support it fully and tout it as the solution to end the war against wild bison; meanwhile thousands of wild bison migrating into Montana from Yellowstone have been shipped to slaughter since quarantine began. Every spring hundreds of buffalo are forced off of cattle-free public lands through state-federal hazing operations right at the height of calving season. Hundreds more buffalo are gunned down by hunters at the boundaries of Yellowstone each year. Quarantine hasn’t stopped any of this, and it doesn’t respect or honor the integrity or evolutionary potential of bison as a wildlife species. Also, the Dept. of Interior / National Park Service is proposing operational quarantine for Yellowstone bison, and Defenders and other larger NGOs have been big supporters of that as well. Does this help? Please let me know and thank you again for your comments. Thanks for the info, Stephany. Anyone know if the Hoppe (mentioned in the comments section) is the same Hoppe that “cried wolf” awhile back over his sheep? That is Bill Hoppe of Gardiner. Yes, the same one that killed a wolf after bringing domestic sheep into the basin where there is a fragile population of big horn. Did Hopppe also pack beaver into the Absaroka-Beartooth Wildernes a few years back for the Forest Service? It would not be the first time Defenders were on the wrong side of an important wildlife issue. Who could forget the Wolf Compensation Trust?????????????? Quarantine might not be the ideal, but if disease free pure bison are restored to the landscape while placating the fears of some, it might be the best option/process we’ve got. Domestication occurs over generations, I guess the proof will be in the success of these herds in their new locale. As test of their domestication I suggest trying to pet their newborn calves next spring! Well, cattle won’t let you pet their newborn calves either, and it even takes a little time to get close to a foal. That’s not the point, the point is that wild, migratory bison do not belong behind fences and that bison quarantine does nothing to restore the wildlife species. You may bottle the genetics that way, but that’s been done a thousand times, and it’s not the only thing special or significant about the Yellowstone herds. Quarantine validates the livestock industry’s brucellosis argument, which is only a theory and a weak one at best. Brucellosis isn’t a problem for bison outside of the politics, and ranchers still cry about brucellosis-free bison. That argument has been steadily losing ground, and they keep trying to come up with other excuses to disallow wild bison to restore themselves. These gentle giants that I and others at BFC have spent thousands of hours in the field with, are one of the easiest wild animals to get along with, but the ranching contingency is now trying to paint them as dangerous, property destroying beasts. Folks living out on the Horse Butte Peninsula here in the Hebgen Basin have literally hundreds of buffalo taking up residence every year — no incidents — a few trees rubbed, but people deal with it peacefully and they love the buffalo there. Anyway, it seems there will always be some “reason” from the anti-bison contingency not to get along with them. Quarantine is just one more mechanism of control and is incongruent with sound and respectful wildlife management. Especially with a native animal that is so emblematic of our continent. This kind of overcontrol needs to stop. Stephany, I agree that Defenders is in the wrong here, but also remember that they aren’t the only ones skewing perception of buffalo…ever seen the state farm commercial where the 2 guys in the car are attacked by a buffalo? The majority of Americans that form an opinion on buffalo base it on what they’ve seen on TV…a now perceived threatening animal that poses immediate ‘risk’ to our assets (car). Most non-westerners see this animal as needing control based on this commercial…it’s most people’s only exposure to the animal. Just like with wolves, how an animal is presented through media may be the most important issue. Allowing an insurance company to use fear of this animal…”like a good neighbor….” is doing worse than what Defenders is doing by far. The cattle industry should write checks to state farm for this insideous commercial….well done indeed. Fear sells!….even in insurance. Mark I think you have the intent of that ad wrong. The father is trying to get his son engaged and impressed by something. When the buffalo comes up to the car the son is duly impressed. Anyhow Stephany thank you for writing this. It strikes me again that wildlife management really needs a big overhaul and that states may not be best suited to manage wild animals. The bigger picture gets ignored. I have seen both of these ads on TV, I believe Mark is talking about the one where the buffalo bangs its head into the side of the car, not the Subaru one with the little boy looking at him through the back window. Thanks for clarification, I was only aware of the one! And thankfully I was aware of neither. Stopped watching “TV” over a year ago. I enjoy watching TV, many of the shows here we did not have in China. Yes W Hong, you are correct. Glad to see Subaru putting them in a positive light. Then work to get brucellosis off the list APHIS enforces. Until then…this process is the best we’ve got. It seems to me this statement depends upon how you look at it. That we do not have a wholly full biological/genetic understanding of the potential impacts/influences that such treatment of bison has in the short term does not mean that such impact/harm does not exist. This is nothing to say of the harm to the individual animals – their suffering . . .
What we can anticipate is that anthropogenic MANagement/selection/influence is very likely to skew the behavior/culture of bison and that both such behaviorial manipulation, which includes fencing and other brutalizing livestock husbandry practices, will influence these bison’s genetic constitution – perhaps even leave vulnerable some traits the value of which we are wholly unable to realize or appreciate. Then there’s the vantage of how we relate ourselves. I would argue that it takes less than a single decade to endorse and lend legitimization to management paradigm of “domestication.” It’s already happening. That paradigm, its regime, ensures that the bison will be domesticated even if it does take such an amount of time. They’re fenced, they’re brutalized like cattle, the genetic and behavioral character is stifled to the degree that they are MAN-handled. It’s a disappointing, uninspiring, anthropocentric and I’d even argue abusive track Defenders is pursuing here. To use the abuse analogy, Defenders is siding with the abuser. That choice empowers the abuser, blunts attempts to articulate an inspired value which serves as a source of empowerment that is requisite to confront the abuse in those forums necessary (political, media, administrative, even among sympathizing membership) to effectuate a lasting and meaningful shift in the way we cohabitate with bison, and the track they’re pursuing it, in a very cognizable capacity, disempowers – politically, and with the public itself – those efforts at empowerment that enjoy an inspired and empowered advocacy calling for an end to the abuse – a reach for the more *wild* resolution. It seems to me that those at BFC, and others, that are pursuing such an aspirational aim ought be encouraged in every way that we can, particularly when cynical things like Defenders’ nonsense occurs. One important way of doing that is to lend your own voice, call out the uninspired groups whose involvement appears pretty objectively to be more harmful to the overall effort than otherwise, as is the case here. Defenders of Wildlife should be ashamed of themselves on this one. This is a problem with wolf and carnivore management, with all species I would guess. Just because we don’t see the effects immediately of human harassment does not mean there aren’t any. Always enjoyed Bob Jackson’s comments, Barb. He was a wealth of information. Barb thanks for putting this up. I find a simple intimate honesty in the quote below. One that is not shared by many in the opposition. I also had a lot of bias to overcome to finally see all life on this earth as equal to mine. Yes, thanks for putting this up – I’ll look forward to perusing the site thoroughly. These two posts are amazing reading, Nancy. Thanks! Nancy, thanks for finding this. It also contains pertinent comments by another past valuable voice Robert Hoskins. I agree with Jeff. There are 200 disease free bison now on the Fort Peck Indian Reservation that were not there two years ago. In a few more years there will be twice that many. How many bison have the Buffalo Field Campaign folks relocated?? I spend every October in Yellowstone and I have to agree with the park managers: The Yellowstone bison herd is too large and needs to be reduced in numbers. Ted Turner should get a pat on the back for raising the bison that got relocated. Surprised by your comments Larry. As a professional wildlife photographer, I’d think you’d be a little more sympathetic to bison and what they’ve had to deal with over the past few decades. Care to share your thoughts as to why their numbers need to be reduced? Bison images don’t sell and Bison Jams cost him time. Sorry Larry, you’re wrong on this one. Way wrong! Visited Larry’s website and couldn’t find one image/shot of a native American bison, even though bison are founding icons of Yellowstone National Park. Larry, bison migrate — they don’t need to be relocated. The Yellowstone bison herds are not too large — the Park’s own carrying capacity study had determined that the Park itself could sustain upwards of 6200 bison, there are hundreds of thousands of acres of public lands surrounding Yellowstone’s north and west boundaries that could sustain at least that much more — that’s just around Yellowstone. The “too many bison” is b.s. and comes from the Livestock industry. The IBMP — written on behalf of Montana’s livestock interests — limits bison to 3,000; that is not a number derived from ANY science, it’s political. If you’re interested in reading Yellowstone’s carrying capacity study, let me know. Hau Mitakuyepi, means “Hello, my relatives/yes, my relatives”, and that paragraph should be listened to with great attention. Reading and seeing the concert of male bison protection of attacked calves, one can understand the assertion of a complex social life. Fences are an unfortunate part of life on this continent now, and we should search for ways to de-fence whenever we can. Is it to save a life you seek? Is it to save a species? Some large wildlife organisations, and many wildlife biologists and ecologists, have had to ask this of themselves, as they deal with those whose priorities involve saving neither. I urge you to support those persons who answer the same as you, yet to respect the slow path that others take to get there. Once the bison roamed as they were moved to, from the very shores of the Atlantic, into the western mountain valleys. Will you remove your own fences, as well as those you do not desire? Your culture has imprisoned many whose only action was to follow their own valid way. “thank you” and invoked again, not some, but ALL our relatives. It’s a sad set of circumstances I read in this article.But with the present day politics in MT Quaranteening these bison just to clean up the political diease brucellous is in reality better for the bison than the constant hazing and harrasment that is very costly while still saving the genetics of the YNP bison herd.Don’t get me wrong it is a fact that bison will not be allowed to roam free in any environment there will always be fences to contain them somewhere no mattereven if its 3million acres of open land there will still be some restriction either real or imagined placed upon theses”wild ” type bison. So get over it and at least we are accomplishing a start to sloving this bison issue. Iagree that MTdol wants to keep the grasses of wherever they a transfered to after quananteine but as of right now they have the IBMP,all stakeholders, sucking up to them just to put an end to the craziness each spring. That’s just it: quarantine doesn’t stop the hazing, capture or slaughter — it doesn’t touch it. It is not a solution, it’s just another tool of control. I respectfully disagree with you that bison will never roam free. And, we will not “get over it” … we will press on, and bison will roam free again. Maybe not in my lifetime, but it will happen. It would happen a lot sooner if less people had less of a defeatist point of view and more of us stood up to the livestock industry. The IBMP is about to expire, too, by the way. This truly is heartbreaking. Shot simply for being ‘uncooperative’? It does sound like a prison camp, doesn’t it. Simply for being a symbol of this country that reminds us of what this country was like before the first Europeans came and felt the continent had to be tamed and controlled. Just like shooting wolves, coyotes and bears for not showing humans the ‘proper respect’. It is like selective breeding for more docile traits, as the more aggressive animals are being eliminated (as well as the biggest and strongest) – so it is a form of domestication. We just can’t stop our obsessive selves. Which came first – brucellosis introduced cattle to the native bison? But, as some here have alluded to, I guess we should be thankful that bison weren’t eliminated entirely . That should read: The more aggressive animals are being eliminated (aggression being vital to the survival of a wild animal). So, we are dewilding our wildlife. From a quick Internet look-up, Yes, Brucellosis did come from domestic farm animals by at least the late 1800s – first goats, then spread to pigs and cattle. From another article – In the early 1900s cattle were grazed inside Yellowstone Nat. Park alongside bison and in 1917 cattle in the Park tested positive for Brucellosis and after that bison also began testing positive to the disease. Brucellosis has now been largely eliminated from cattle and other farm animals by intensive medical treatments, and it is still found in some bison and elk in the Yellowstone area. The brucellosis that is impacting bison and elk (politically, anyway) came from imported cattle. All transmissions between cattle and bison have been human induced. There has never been a documented case of bison transmitting brucellosis to livestock, even where they coexist. The threat of transmission is theoretical. Bovines that contract brucellosis may miscarry once, then they develop immunity. The only way people can get it is from drinking unpasteurized milk, mishandling reproductive organs/tissues of an infected animal, or sticking your hands where they shouldn’t be. If you eat elk from the GYE — you’ve eaten brucellosis exposed and infected meat, bet on it. Did you know that when the IBMP agencies test captured Yellowstone bison for brucellosis, they do blood tests (sero) that only determine exposure, the tests do not determine if an animal is actually infectious or not. But, all buffalo that test sero-positive are shipped to slaughter. The high percentage of sero-positive buffalo have developed immunity to brucellosis — antibodies — and they are being removed from the population. The test-and-slaughter program does NOTHING to address prevalence and it most likely is harming the buffalo population’s ability to resist it and other diseases. Stephany thank you for bringing this issue to light. It’s hard to fathom the power the livestock producers industry have over wildlife policy. Its so piss poor and weighted in favor of the producers. I’m starting to feel as bad for the bison as the wolves. Shipped to slaughter for testing positive for exposure to a disease that the livestock brought in. Jeeze how screwed up is that. It’s like condemning humans who have antibodies for ebola in their blood (and are now immune) on the assumption that they’ll transmit ebola to others. That scenario might be based on fear and ignorance. Killing sero-positive bison is based on greed and malice by the livestock industry and its many accomplices–and fueled by our tax dollars. Stephany…THANK YOU for this excellent analysis and condemnation of quarantine. Though I’ve been involved for 10 years and have always known quarantine to be a sham, I struggled to articulate ‘why’ with adequate clarity given the complex, convoluted nature of this wildlife issue. And then one has to counter the misleading public perception created by groups like DoW and the media–that this “saves” bison. (All those slaughtered in the quarantine protocol don’t get to weigh in on that…they are forgotten victims.) You’ve laid it out clearly and forcefully–thank you. Elk have the same disease so why is there no concern about them? There should be Bison on all the public lands of the west. However Stephany I wasn’t with you on your first post, you came across as angry and unfair. Be careful to explain in more detail. The big sin here is not Ted Turner or Dakota making the best of a bad situation but the DOF is making it sound like this is a success so the public is no longer outraged by the practice. Wow. It was only a matter of time……where don’t elk co-mingle with cattle? Thank you BFC for all that you do. The general public needs to know what is really happening to these bison, and they need to stop supporting groups like DOW that seem more interested in fund raising than in true conservation. DOW supports the “sustainable” hunting of wolves, too. Sorry for the typo I meant DOW. Also AG everywhere (whether we are talking cattle, corn, factory hogs, GMO seeds) is way too powerful and pigheaded at the same time. Defenders stands with everyone who continues to oppose the shipment of Yellowstone bison to slaughter, and with everyone who continues to demand that Yellowstone bison are allowed to simply be wildlife outside the boundaries of Yellowstone National Park. We appreciate that there are different approaches to resolving the longstanding and ongoing tragedy of bison management around Yellowstone National Park. We agree that sadly some parts of the livestock industry have driven bison to be managed more like livestock and less like the wildlife species they are, and we continue to work with many others toward a better solution by promoting social acceptance of these animals, gaining more room for wild bison to roam in greater numbers and opposing the shipment to slaughter. Our staff has devoted their careers to wildlife conservation and restoration, which took another large step forward with the second large transference of bison last week to Fort Peck. Temporary quarantine and relocation programs have been used to bring dozens of species — pronghorn, bighorn sheep, white rhino, panda, black-footed ferret – back from the brink. This is also the only way to restore Yellowstone bison to their historic home on the Great Plains. Defenders will continue to work for bison restoration elsewhere, to areas where they can grow over time and restore their important role on the environment where they are desperately needed. Defenders makes a great deal of money on posts about wolf recovery, bison, and other wildlife issues. I had never thought much about the amount of money Defenders has brought in over the years until the director of a national NGO brought it to my attention and said what has been gained in all these years. we are right back where we started. Since wolf recovery, Defenders has made a staggering amount of dollars and as my friend pointed out, much of it on the backs of dead wolves. Don’t get me wrong I understand you have to do fund raising, its part of being effective. Yet, the money needs to be used effectively, proactively. Defenders needs to do more than use it to continue fund raising. The biggest concern I have about Defenders and some of the other big NGOs, is that it appears you operate in a vacuum. By that I mean I think the big NGOs making the big money have an obligation to foster cooperative alliances to promote better management of the species they are working to protect. And I don’t mean sending out numerous sky is falling e mails to raise money, but real grass roots problem solving proactive agreements that target big long term solutions. I don’t see that happening. I give you this challenge. Instead of writing something that sounds rehearsed and canned, “Defenders will continue to work for bison restoration elsewhere, to areas where they can grow over time and restore their important role on the environment where they are desperately needed.” how about contacting the little guy here, Stephany, and working with the boots on the ground warrior fighting for Bison, and put some money and brain power into reversing the politics that drive bad bison and wolf policies. if the big NGOs would form alliances with each other and with the smaller groups a great deal more would be accomplished. The way Yellowstone bison are treated, “managed,” “cared for” is heartbreaking and disgusting. People need to understand though that it is part of the greater program of the cattle industry for the West. Despite the best efforts of many activists and the often confused efforts of the general population who love the Western outdoors, what the cattle industry has always wanted is 180 degrees in the opposite direction. That have always wanted a West where the outdoors is defanged, tamed, made into a big fenced pasture that is broken up into millions of little fenced pastures. They hate wildness. They stand for control — control over both wildlife and other Americans. We will not throw their saddle off our backs with a just victory on Yellowstone bison. It would certainly feel good though. + 1 Ralph. Course it helps to live out here in the west and witness it first hand. Spoke to a ranching friend the other day and she mentioned a wolf pack of 7 was in the area, causing some to be anxious but, in almost the same breath, mentioned seeing an immature bald eagle (eagles fascinate her) feasting on one of their dead calves. WTF? I do not have a dog in the fight but Defenders of Wildlife and Ted Turner helped save the lives and returned 208 Yellowstone bison to their original habitat. Defenders works with MFWP within the GYE when bison conflicts arise by installing temporary fencing, are working on the ground in restoring black footed ferrets to the American Prairie and were instrumental in the successful return of wolves to Yellowstone by creating the NECESSARY compensation fund, yet the organization gets little positive recognition on this post. Defenders never said all is fine, but this is the BEST option RIGHT NOW to allow more bison to return to their original home. Just curious, how many bison have been directly saved by Buffalo Field Campaign? Also, the post discusses First Nation culture regarding bison, however I believe it was First Nations who were recently slaughtering bison as they migrated out of YNP and were made to stop because of the huge amount of gut piles that were attracting bears and wolves. The post spent 99% on why quarantine is not the answer and 1% on their solution (expanded habitat). As for expanded habitat, as long as there is a demand for livestock products and ranchers can make money, cows and sheep are not going anywhere. We each can do our part and not buy products made from livestock as much as possible. Instead of just condemning an action, the post should have provided specific viable options. Well then Gary, I’d like you to elaborate on how many wolves were saved with the million dollar (plus) Defenders spent on the totally “unnecessary” compensation fund. It’s a fair question in light of your challenge to BFC efforts. I think we can agree that the re-introduction of wolves to Yellowstone and central Idaho is one of the greatest conservation victories in America, period. Whether the compensation fund was “necessary” or not, certainly many of the “powers to be” in favor of re-introduction thought so and its not for me to question their judgement. Defenders of Wildlife was one of the leading conservation groups involved in the re-introduction and I applaud their efforts then and now. And I would certainly agree with their efforts relative to the re-introduction effort. I also commend them as to other programs that you have noted previously. I deeply recent running cattle in National Parks and on public lands. This began with the 19th century idea that this land has no value so just run a few cow on it. Now we know better and I suspect the average American would be very unhappy to see the great wildlife tragedy that unfolds each year just so a few animals could be raised on public land. Stop it put them in fed lots like the other 99% of American livestock. Regulations prohibit cattle from National Parks but are allowed to graze on Forest Service and BLM. I agree that livestock should not be allowed within important corridors for wildlife migration (bison, pronghorn antelope, mule deer, and Rocky Mountain Elk), riparian areas, and critical habitat for ESA species, however for the vast majority of lands, well managed grazing is appropriate. Right or wrong grazing allotments are allowed and if conditions are met are renewed but there are ways for removing livestock from public land. Confusing Gary. What is the point of a “buy out” if ranchers continue the practice of abusing the land? Differs little from paying ranchers to leave segments of their private property under sage brush (say to benefit sage grouse) yet still run cattle on the land. With less grass available, cattle round sage brush, just like they round willows on creeks, leaving little cover for wildlife/or aquatic life. Unfortunately Gary, in most cases there are not ways for removing livestock from public lands. A bill in this last Congress was introduced to authorize voluntary buyouts of grazing allotments for all public lands, and to no one’s surprise it was supported mostly by Democrats and opposed by most Republicans (and the livestock industry) and it never even made it out of the House of Representatives. The BLM is in need of the biggest fix from the legislature, but that doesn’t look like it will happen anytime soon. Defenders of Wildlife has done an outstanding job helping tribal wildlife programs in Montana and the Dakotas. While calling the quarantined bison “wild” may be overly optimistic, the fact remains that Defenders played a critical role with relocating the Yellowstone bison to both Fort Peck and Fort Belknap Reservations. How these bison are managed will be up to the tribes. Now there are 2 more bison herds on the prairie where there used to be cattle. That is a step in the right direction.